The morning of the 39th Annual (and my fourth) Imogene Pass Run dawned clear and surprisingly warm in Ouray. In previous years I'd worn arm warmers along with my short-sleeved shirt, as well as fleece hat and gloves, and kept my rain/wind jacket on as I lined up for the start, stuffing it into my pack at the last minute. This year, it didn't matter that I had forgotten my arm warmers back home in Durango; I wore a headband instead of a hat, and the jacket stayed in my pack as my friends and I headed for the start line. On Saturday I'll be running the Imogene Pass Run for the fourth time (you can read my previous race reports via my Imogene tag). 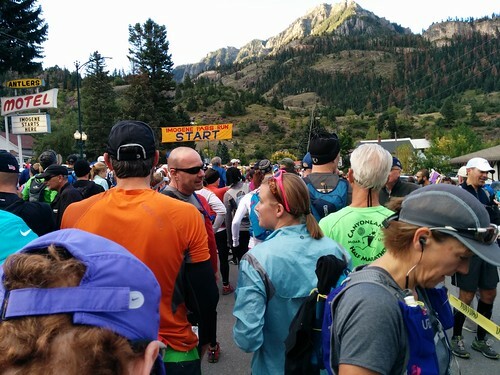 It's an entirely gorgeous race, 17.1 miles from Ouray to Telluride over a high mountain pass. As far as my goal and plan: my PR on this course is 3:54:26 from two years ago (the last time I ran it - last year I had a stress fracture and didn't run) which was only a tiny PR over 2009's 3:55:07. However, in 2009 I ran the Kennebec Challenge in 3:19, and this year I ran it in 3:04, a 15-minute improvement. I'm a little reluctant to project that to a 15-minute improvement at Imogene, since a) Kennebec is about 2.4 miles and 1000 vertical feet shorter than Imogene, b) this year's Kennebec course looped in the opposite direction from the 2009 course, and c) and a friend of mine ran Kennebec in 3:06 and Imogene in 3:50 last year. I have similar mileage over the past 8 weeks or so, although in 2009 I had higher mileage over the longer term (since I cut back hard over much of June this year), and in 2010 (my slight PR year) I had substantially lower mileage. (In 2010 I was faster uphill but slower downhill, at the end of the race, than 2009, which I attribute to the lower mileage.) I'm in better shape now than in either of those years, based on shorter-distance race times and training paces. I'm about 4 pounds lighter than I was in both these previous races. A month after Imogene in 2010 I ran the St. George Marathon in 3:36; I am reasonably shooting for 3:25 at NYCM in November. So. I think my A goal here is 3:45, my B goal 3:49, and my C goal a PR. However, this is not the kind of a race where you can target a pace. I'm just going to run this sucker and hope I make my goals! It was a glorious day, what we call a "bluebird" day here in Colorado, for the 37th annual (and my third) Imogene Pass Run, a 17.1-mile trail race mostly on jeep roads. The morning dawned cold and clear, and the race director took obvious glee in telling the runners, as we assembled at the start line shortly before 7:30am, that the temperature was currently 24° at the summit, some 10 miles distant and 5000' above us. I lined up with my friends from the RWOL forums, Jen, Annette (whose first time it was), and Karah, and when the gun went off, so did we. 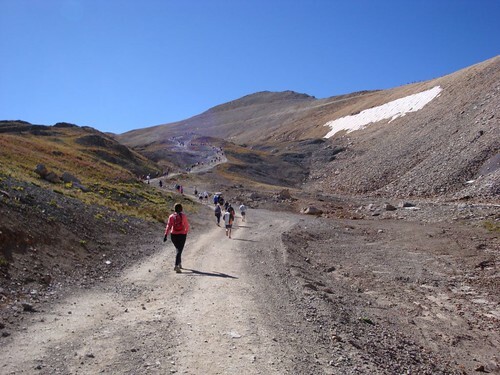 The Imogene Pass Run is one of those idiosyncratic races that you either sign up for again and again each year - or you shudder at the mere thought and never consider it. I am clearly in the first category, as I did it again this year. There is something irresistible (at least to me) about running from one mountain town to another over a high mountain pass. The cool thing about running a race for a second time is that not only do you know what to expect; you also have a mark to compare yourself against. My last year's time was 4:11; this year, I wanted to get under 4 hours, with a backup goal of simply beating that time, and a magic pixie dust goal of 3:45. I've been running a lot more this year, and running more hilly trail miles as well, although I have spent less time hiking or at altitude. I had analyzed my mile splits versus the terrain, and made some crazy assumptions as to how much better I might be able to do. I had put together a pace card with guesses as to where I thought I would be each mile, mostly using the most pessimistic assumptions, and came up with a total time of 3:54. In fact, I ran 3:55, which looks like I hit it right on, except in reality I was about right on the first 6 miles (the reasonably steep part), way slower than I expected on the next 4 miles (the unreasonably steep part), spent too much time on the summit (and, er, in the portapotty just below the summit), and was much faster than I expected on the descent. One of the joys of doing this was meeting up with a bunch of women I knew from a running forum. Two who live about 4 hours north of me I had met (Deltarose and Kazz - Kazz and I had met at Imogene last year, and the two of them had come down for the Steamworks Half in June) and two (Cara and Jana) live in Nebraska and had somehow let Kazz and me talk them into signing up. Jana made awesome t-shirts that we each wore at least part of the time during the race. The funniest thing happened at the finish line. At the end, the course turns right onto a paved road and goes a block or so to the finish line, and that's where most of the spectators are. As I approached the line, a woman passed me on the right. I thought, well, hmmph! and sped up and sprinted past her. JUST as I got to the finish line, she passed me again, and I turned on the afterburners and we ran shoulder to shoulder across the line in a photo finish. (Although according to the official time, she edged me by 0.2 seconds!) Then we looked at each other - and it was Deltarose! We had both been so focused we hadn't realized who each other was. ...which is probably why we all agreed to sign up again next year. Imogene Pass Run: the most fun I've ever had while wanting to throw up! Saturday was the Imogene Pass Run: 17 miles (plus two blocks) from Ouray (7810 ft) to Telluride (8820 ft), over 13,120 foot Imogene Pass. That's over 5000 vertical feet up in 10 miles, followed by over 4000 feet down in 7 miles, most of it on a rough and rocky 4WD road. It was the most awesomely fun race I have ever run. I averaged about 11 minute miles and made it to the finish line with a time of 4:10:42, 19th out of 73 finishers in my age group. I was hoping to get in under four and a half hours, so I'm really happy with that time. All the photos on my Flickr page are here.